Bat Toy Miniature Replica at Animal World®. Bat Toy Miniature Replica is educational play fun at Animal World®. Featuring a realistic look and soft flappable wings this Bat toy miniature is made of durable bendable plastic, has a small tag info booklet and measures 10"W x 3.5"L x 1.25". 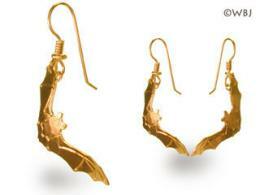 Shop our Bat Gifts at Animal World® for all our Bat lover gift ideas. Shop our Animal Toy Replicas at Animal World®. page for all our plastic animal toy miniatures.